Today’s post on OneNote was written by Avneesh Kohli, program manager on the OneNote team. Today, we’re announcing the OneNote Share extension update for your iPad and iPhone, making it easier than ever to send content from your favorite apps to OneNote. All you need is an iPhone or iPad running iOS 8, the new operating system. 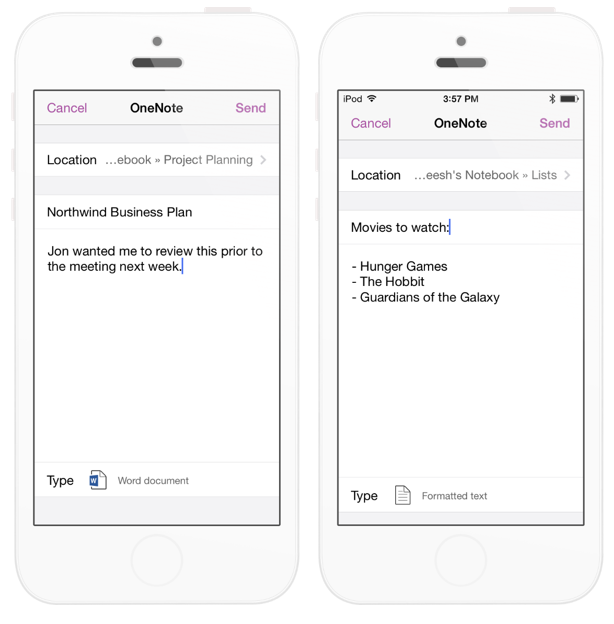 Get started by downloading OneNote for iPad or OneNote for iPhone for free from the App Store. If you already have OneNote installed, simply open the App Store and get the latest version from the Updates tab available. 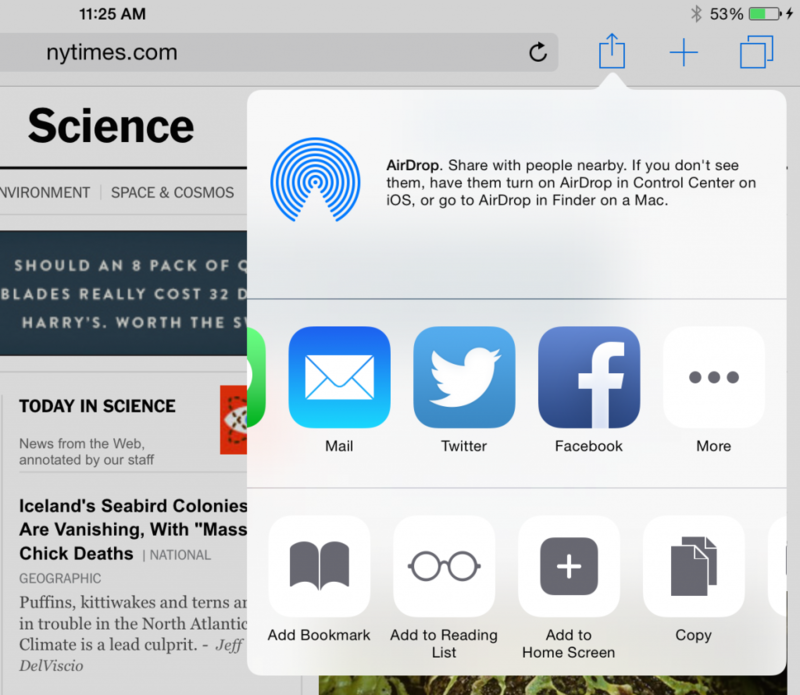 As soon as your phone updates to iOS 8, you’ll be ready to use the Share Extension. Lastly, make sure are signed into OneNote with your Microsoft account on your iOS device, so you can enable the Share extension functionality. Next tap More to display the list of all the extensions you have installed on your iOS device. OneNote will appear in this list. 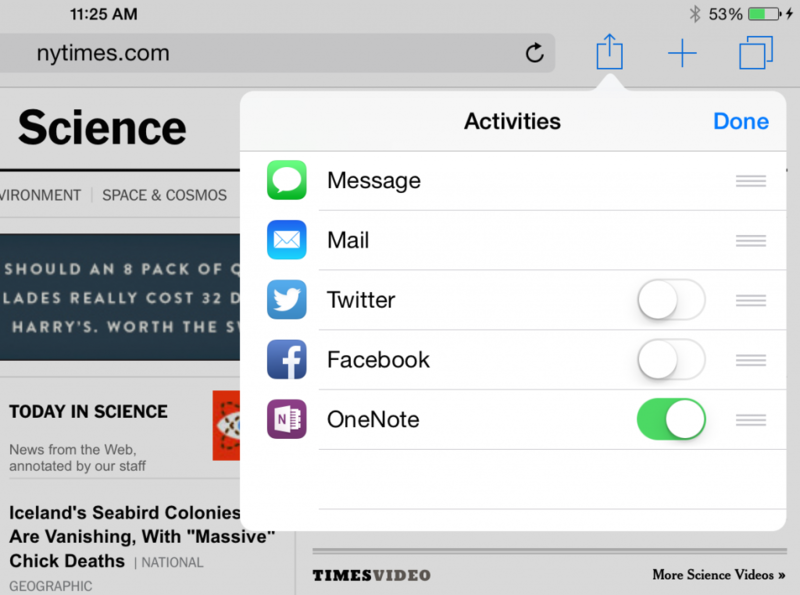 Toggle the switch to add OneNote to the Share menu. Once it’s enabled, tap Done. You are returned to the main Share menu and the OneNote Share extension is now visible. Once enabled, the OneNote Share extension makes it easy to clip websites, export file attachments, save photos and more. Simply look for the Share button in any app and tap OneNote to start sharing content. For example, to save a webpage in Safari to OneNote, tap the Share icon in the top right and select OneNote. 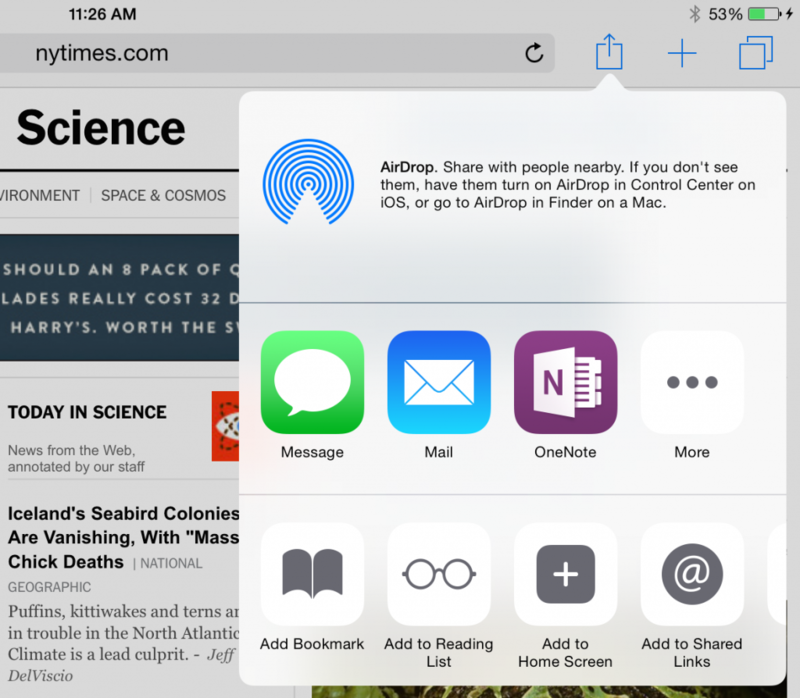 The OneNote Share extension will appear right in Safari. 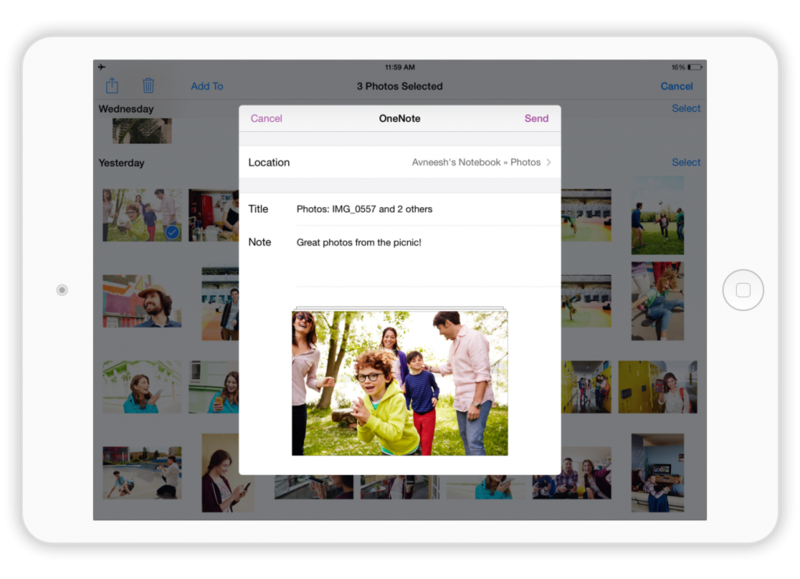 You can select exactly where you’d like to store your content—just tap Location and select your preferred notebook and section. The OneNote Share extension supports sending content to both OneDrive and OneDrive for Business notebooks. OneNote automatically populates the title field with the name of the webpage. Want to change it? No problem, just tap and edit. If you want to add some additional notes to your clipping, whether it be some extra context or just something you want to make sure you don’t forget, just add it to the Note field. If you’ve got an internet connection, OneNote will show you a preview of the webpage and will include the entire webpage when it’s saved it to your notes. Don’t worry, the URL is saved for you as well, in case you’d like to return to the page later or on another device. 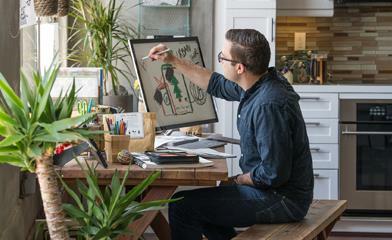 The next time you open OneNote, your notes are imported and available on all your devices. 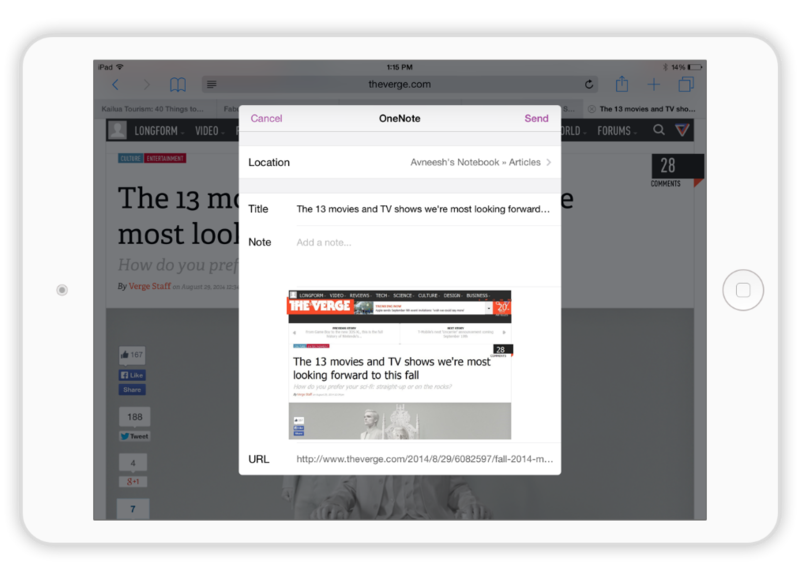 We’ve also designed the Share extension to work even if you’re offline, so if you’re on the go with your iPad or want to limit your cellular data usage, we’ve got you covered. Here’s just a sampling of the types of content you can send to OneNote using the new Share extension. Whether it’s class notes, recipes or travel plans—the more content you put into OneNote, the more you get out of OneNote. Countless people have expressed this to us, and as a result we’ve been laser-focused on making it easy to get everything you need to remember into OneNote. We hope you’ll love OneNote Share extension as much as we do. As always, we want to hear your feedback so that we can continue to improve your OneNote experience—making it the best place to store your notes and memories. We read through every piece of feedback we receive!